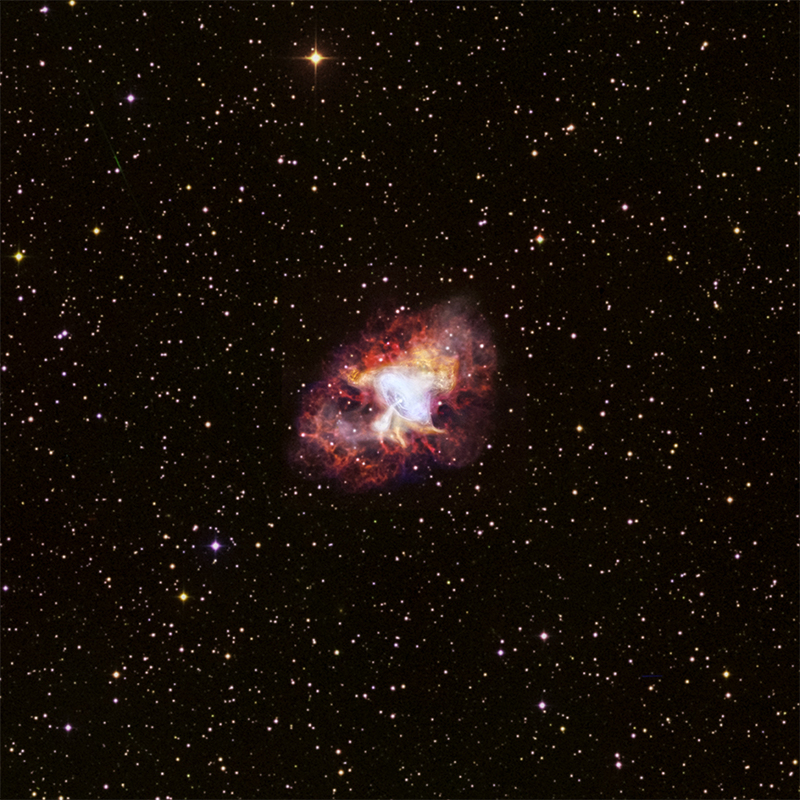 Explanation: The Crab Pulsar, a city-sized, magnetized neutron star spinning 30 times a second, lies at the centre of this tantalizing wide-field image of the Crab Nebula. A spectacular picture of one of our Milky Way's supernova remnants, it combines optical survey data with X-ray data from the orbiting Chandra Observatory. The composite was created as part of a celebration of Chandra's 15 year long exploration of the high energy cosmos. Like a cosmic dynamo the pulsar powers the X-ray and optical emission from the nebula, accelerating charged particles to extreme energies to produce the jets and rings glowing in X-rays. The innermost ring structure is about a light-year across. With more mass than the Sun and the density of an atomic nucleus, the spinning pulsar is the collapsed core of the massive star that exploded, while the nebula is the expanding remnant of the star's outer layers. The supernova explosion was witnessed in the year 1054.